THE REVIEW: Pixar already struck big this year with Inside Out but they strike again with the visually stunning The Good Dinosaur. Visually stunning seems to be the consensus of most critics and anyone who tells you otherwise is probably not seeing the same movie everyone else is. It uses a new animation technique for Pixar and while the director of photography Sharon Calahan says it’s not, “exactly photorealistic” but rather “authentic”, it looks pretty darn photorealistic to me and is incredible to watch. Every single shot; wide landscapes to closeups on the dinos. Critics have also seemed to agree that while the visuals are top-notch, the story leaves something to be desired; at least compared to other Pixar films. This was my feeling for the beginning and much of the middle of The Good Dinosaur. It’s not particularly bad or uninteresting, just not as instantly memorable as something like the opening sequence of Up or the classic Toy Story. Animated personified dinosaurs do fall right up Pixar’s wheelhouse though and the alternate history of what would’ve happened had the asteroid which caused them to go extinct missed Earth is equally fascinating to think about. But it’s message seems a bit too in-your-face as Poppa Henry (Jeffrey Wright) tries to teach his son Arlo (Raymond Ochoa) that he must leave his mark on the world in order to enjoy living. And while this bluntness does detract and take you out of the world you are shown, it morphs into something much more subtle and impactful by the end. Arlo learns the true meaning of what it takes to live a happy and rewarding life. Being with friends and family is all it really takes to leave a mark in this world. 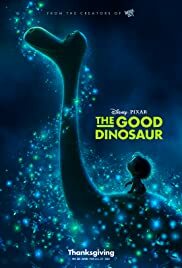 THE TAKEAWAY: The Good Dinosaur certainly isn’t as memorable as other Pixar films and for that reason probably won’t go down as one of their best films. But while it’s not memorable, it still is groundbreaking in terms of visuals and impactful in terms of the overall story it tells. There are bumps in the road and for a while it doesn’t seem all that promising, but like a good underdog, Arlo and The Good Dinosaur pull out a win in the final minutes and leave you once again sniffling in your seats at the brilliant work the animators did to bring a total “what if” world to life.